With the fall season officially starting tomorrow, school is back in session........which means it's time for the next homebrewing course at Veterans United Craft Brewery!! VUCB, in partnership with Brew, Bottle, & Tap, is hosting a class & brewing demonstration to build upon the introductory foundation of our previous course. Homebrewing 201: All Grain - "Brew in a Bag" will be held in our Special Events Room on Wednesday September 30th, starting at 5:30pm. Please note the earlier start time.......this is due to the length of the brewing process. Led by Michael Anderson, owner of Brew, Bottle and Tap, the lesson will instruct and demonstrate to students the Brew In A Bag (BIAB) technique by brewing a beer --- Sweet Stout --- during the class. You'll review the essential equipment needed for BIAB & compare to the commercial equipment used by brewers at Veterans United, discuss the ingredients used for this brew, and participate in brewing the beer. Your liquid education also includes a refreshing pint of VU beer! Best of all, after ~ 5 weeks, you'll be able to stop by and pick up a 12oz. bottle of this demonstration beer (one 12oz. bottle per student). Enrollment will be strictly limited for this course & handled on a first-come, first-served basis.....so don't delay in registering for this event! The registration fee is $20 per person (includes 1 VU beer and 1 12oz. bottle of demonstration beer) and is due at the time of signup. This event is open to adults 21 years and older. Sorry, no refunds for cancellations. 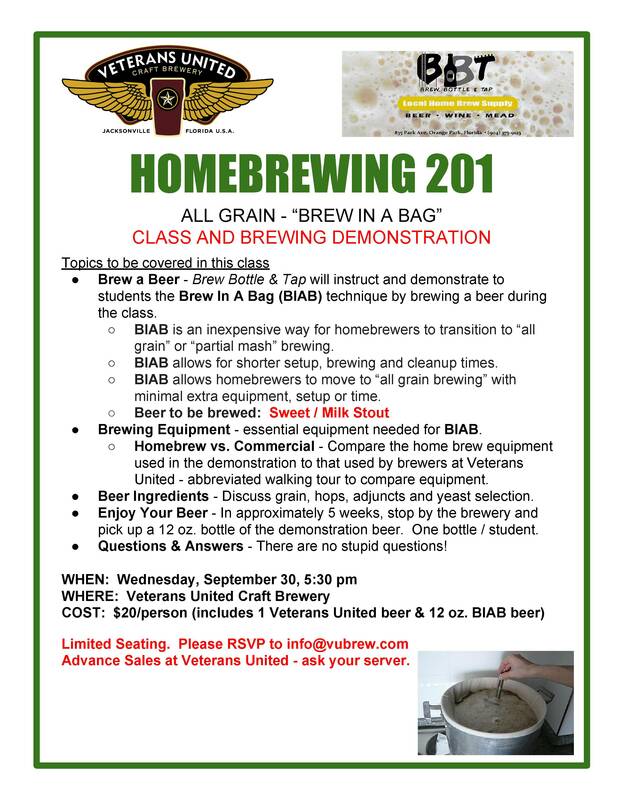 Join us for a great time with a hands-on learning experience in home brewing. This is definitely a class you don't wanna skip! Our Special Events room is available for private rental for all your celebratory needs. Conveniently located adjacent to the taproom, this room is perfect for any party for up to 50 people. We welcome you to bring in snacks, host a potluck, or have your event catered on site. We can offer you recommendations on how to create a perfect, beer-infused event. Please email us at info@vubrew.com with any requests and questions if you are interested in hosting a get-together here. Check out all the updates to our schedule on our website, our Facebook page, or by following us on Twitter. We love and appreciate all the comments, questions, and photos you share with us (we're on Instagram, Tumblr, and Untappd, too! ), so keep 'em coming. We don't want you to miss out on the random beer-riffic specials and giveaways posted via social media, so get connected with us to save on your suds and sometimes score some sweet stuff. We'll see you at the end of Western Way! Copyright © 2015 Veterans United Craft Brewery, All rights reserved. Received this as a forward and want to subscribe to our newsletter? Awesome – sign up here!